As a new father, I wasn’t sure what to expect. After trying a few older models by different brands, I ended up just getting something cost efficient by looked stable based on reviews. When I ordered these, I had pretty good hopes, but was very surprised. They are amazing. Before our baby came, I would be in the nursery setting up things and could communicate very easily to others throughout the house (was on a ladder). After a bad thunderstorm, we lost power, and they still worked just fine. They now work great with baby in the nursery and we are so happy we got this brand/model! Apartment living and no external interference. I had this unit shipped overnight after our NTM-910YLW – Sony Baby Call Nursery Monitor unit started having constant issues with a ticking noise that would not have been very sleep-friendly for parents. Prior to this, we would get interference with cell phones and other electronic devices intermittently, but we perservered. Let me note first that I have only just got the VTech today, but already I like it. I chose the model with two receivers so that we could have them permanently in the two rooms most frequented (bedroom and living room). The parent units require an initial 11-18 hour charge before unplugging and using without the power cord. There are two different instructions. Therefore, I would suggest going with the longer charge to ensure the battery is well conditioned. Aside from the hiccups that our Sony had, let me point out some major ‘user-related’ differences. The Sony NTM 900 that we bought had only one parent unit. This particular VTech monitor came with two parent units. Sometimes when going to bed, I’d forget to grab the monitor, so it’s one little hassle I don’t have to consider now. The Sony NTM 900 is analogue and while you can adjust channels, if you have a lot of electronics, or many neighbors, you will probably find this is not the model for you. The VTech is digital and uses DECT Technology (the same stuff as is used with cordless telephones). I’m not sure that a police scanner won’t pick up on your baby conversations, but they claim it’s very secure. So far, I have no outside interference, funny noises etc (unless you count the baby babble). Even though we have a sound machine in baby’s bedroom and the lullaby is always going, the Vtech monitor is barely picking it up, but it will respond when baby starts to make a noise. I like this, because I’m starting to go a little crazy with Rock-A-By Baby and Twinkle Twinkle Little Star. The Vtech has different options for being alerted to baby noises. You can set it to vibrate, have a sound alert, or actually hearing the baby. It also has the ability to talk from the parent unit to the baby unit so that if you wish to soothe baby without going in and disturbing him/her, you can. The Sony NTM 900 was one-way only. This was the first time I had chosen one day shipping and am very pleased with Amazon (and UPS’s) service. It was worth it. I can sleep in my bed again tonight and not in the nursery. Update 09/23/2012: Roaming distance outside is at least 250-300 yards (at a guess because I’m not good with guessing distance) and product is still working perfectly without interference. I’d definitely recommend a digital monitor over an analogue one. Update 05/04/2013: Product worked great, but after the baby unit was disconnected from the wall recently (by mistake), we have been unable to resynchronize the parent units to the baby unit, which renders them pretty useless. So, while I rated this as a good product, it could be something we’re doing wrong, so I’m a bit loathe to downgrade my initial review just yet. Just note that I’m not the only person to have had this issue. UPDATE 6/4/13 – I’m keeping the Vtech rating at 4 stars. This is due to battery life. I can get about maybe 6-8 hours out of a charge, which is not very much. I’m guessing they really cheaped out on the battery. It does beep to alert you when the battery is running low. As long as you remember to plug it in every evening, it’s not a problem. Otherwise, it’s a fabulous unit and has been working excellent for our family. Still the best choice of the 3 I reviewed below. I’ve owned the below 3 units over the course of the last 2 years. I recommend the VTech for now (I’ve only had it a few weeks, but it is by far the winner in performance AND value). For features, I only listed the features that I felt would be important to the average buyer. Some of the units had other features that I didn’t list because I didn’t think there were critical in my decision making process. Also, it might be important to note that we live in a 2 story house and we have Wi Fi. Ease of use and customization of features (ie: setting the sensitivity level, etc): easy, intuitive. Other thoughts: Loved this monitor until……. after about 6 months of use the parent unit would randomly turn itself off with no warning, no beeping, nothing. I started waking up in the morning to an “off” parent unit. This happened even if it was plugged into the charger. When I pressed “on”, it would power up just fine and work well for a few days. Then it would shut off again. After a few weeks, it started shutting itself of more and more frequently. Thought it was a faulty unit, so I called Avent and they promptly sent out a replacement for free (nice customer service!). After few months of use the second unit started doing the same thing. Therefore, cannot recommend this product – it’s dangerous if it turns off while you’re sleeping. If you run a search on the reviews for this product for “turns off” you will see that it has happened to others. Visual sound indicator – yes. But it’s not LED (which is very bright), it’s part of the digital display, so you probably wouldn’t notice the bars lighting up. So, yes, there is a visual sound indicator but it’s poorly designed rendering it not useful. Ease of use and customization of features: HORRIBLE, clumsy, not intuitive. You WILL need to bust out the manuel everytime you want to changes something. Channel selection is done at the Baby Unit, not the Parent Unit. That means if you have a bad connection, you have to go into the nursery to change the channel and possibly run the risk of disturbing a sleeping baby. You have to go through a series of random steps, pushing buttons in a certain sequence on both the nursery unit and parent unit. Also, it doesn’t scan the channels to seek the best connection. You have the manually go through and listen to each channel and decide which one sounds the best to you. Sensitivity adjustment is also done on the Nursery Unit. Temp display is bizarre. If you turn the Parent Unit on AFTER the Nursery Unit (which is about 99% of the time, since I, like most people I know, just leave the Nursery Unit on 24/7) the display shows the channel. And will stay on the channel until the temp changes. So, the only way you can see what the temp is if the temp changes. It would have made a lot more sense to have the channel appear on the display first and then time out and default back to the temp setting since I think that as long as you’re getting a good signal, you don’t really care what the channel number is. But you probably do care about the temp. Signal: 8 channel 927 MHz frequency. Started off good but after several months of use, the reception isn’t as clear. I’ve tried all the different channels, but I still get intermittent static. It’s annoying because it wakes me up. Other thoughts: display on the parent unit is BRIGHT. Some may find it annoyingly bright if you like a really dark room. I originally thought this was a good value (at the time of purchse, my point of reference was the $95 Avent), but now after owning the $29 Vtech, I think the Angelcare is totally overpriced, especially considering how difficult it is to program the features. Not acceptable. Ease of use and customization of features: easy, intuitive. Signal: excellent. DECT technology, same as Avent. Now, I’ve only had this unit for a few weeks, so hopefully the quality doesn’t start to go downhill after a few months. If so, I will post an update. Other thoughts: this monitor also has a “vibrate” feature, which I thought was interesting. On the parent unit, you would not be able to tell it’s on if the room is dark because the display screen is not backlit unless you are actively pushing a button on the unit (I assume to save battery power, it goes into a “sleep mode”). I wish there was a small LED indicator for this. After my Avent experience above I have trust issues ;). With this parent unit, I have to reach for it and push a button so the screen lights up to confirm it’s actually on. It’s minor, but I think worth mentioning. The Avent monitor had a small LED that was lit when it was on. 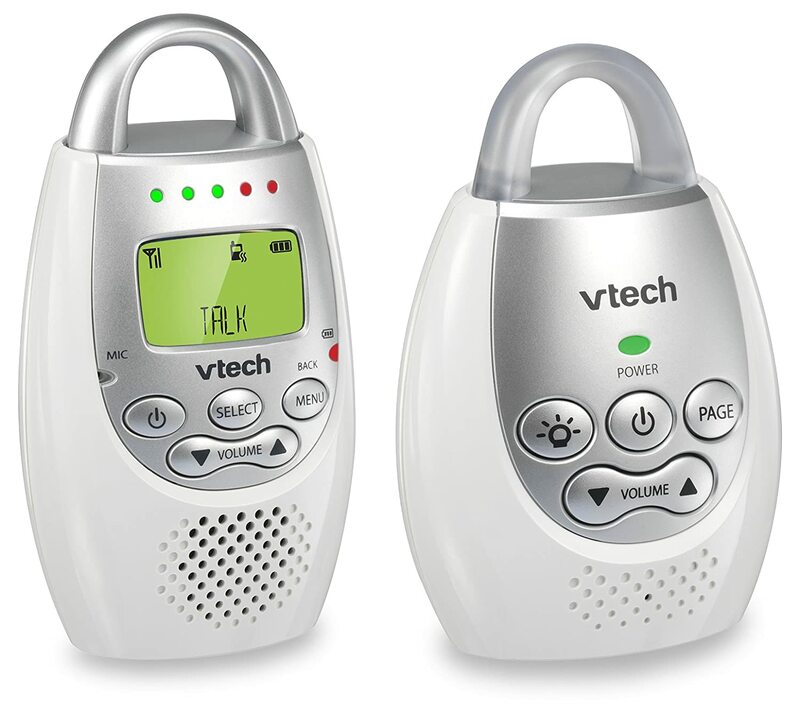 For the price, the clarity, the features, and ease of use, VTech wins hands down. It has all the same features and clarity that the Avent had (actually, the Vtech has even more features with the sound alert and vibrate alert), but it was 1/3 of the cost. So, unless it starts shutting itself off, this is a FANTASTIC monitor at a FANTASTIC price.